Get one of these for everyone in your unit by completing three easy steps. Update: April 21, 2015 — There is an updated version of this award. Click here to learn more. Drink Right, Move More, Snack Smart. Those six small words hold big power. Power to make your unit, and therefore your Scouts, healthier. Changes you employ today could have positive rewards that last Scouts a lifetime. And speaking of rewards, if you make three health-conscious changes over the next three months, you’ll earn a special patch for everyone in your unit. Now do I have your attention? There’s more than a patch at stake, though. For the first time in two centuries, the current generation of children in America may have shorter life expectancies than their parents. Sure, mom and dad play a vital role in their children’s diet and exercise habits. But Scout leaders can make a difference, too. After all, you’re with these kids one night a week and one weekend a month, typically. What you do at unit meetings and campouts matters. Ask yourself: How active are your meetings? What snacks do you serve? What do Scouts drink? The Boy Scouts of America has partnered with Healthy Kids Out of School to offer an incentive to reconsider your answers to those three questions. Say hello to the Healthy Unit Patch, which encourages units to follow the BSA’s SCOUTStrong recommendations at meetings, events and excursions. Make these three positive changes — and track them using the scoresheet found under “Resources” below — and you’ll earn the Healthy Unit Patch. Once your unit has completed all of the Healthy Unit Patch activities, please send the completed tracker form to: HealthyKidsOutofSchool@tufts.edu or call Healthy Kids Out of School at (617) 636-0833, for free patches for your Scouts and a certificate for your unit. Those Units who complete the Healthy Unit Patch and mail their scoresheet to HealthyKidsOutOfSchool@Tufts.edu by June 30, 2014, will be entered into a random drawing for one of five free cases of the Drink Right water bottles seen at right. They come 50 to a case. This isn’t just the BSA recommending you make these changes. Eric H. Schultz is president and CEO of Harvard Pilgrim Health Care, Healthy Kids Out of School’s major supporter. He’s also a distinguished Eagle Scout. That makes him uniquely qualified to speak about both the health side and the Scouting side of this new opportunity to make meetings healthier. 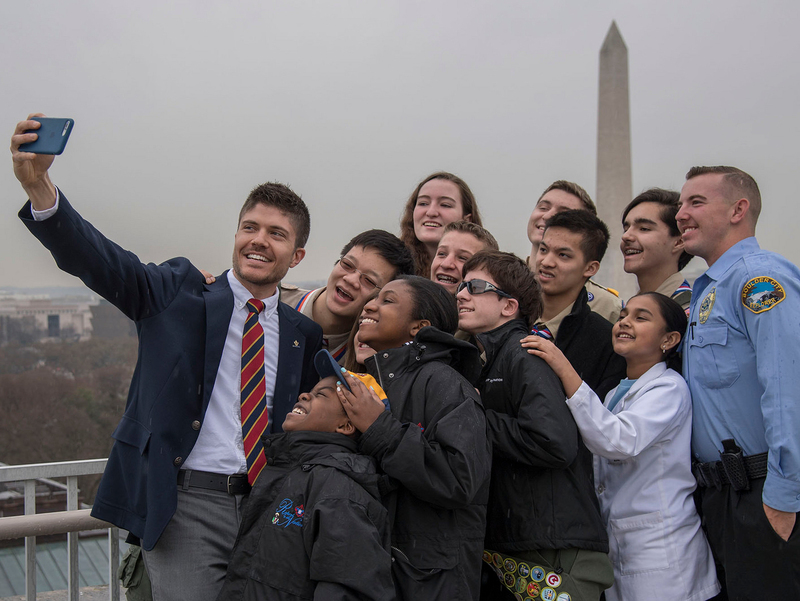 “As a lifelong volunteer in Scouting, I appreciate the values, dedication and commitment it takes to be a strong leader,” he says. “Through the Foundation’s support year round, out-of-school time programs like the Boy Scouts are making after-school programs healthier. Alyssa Koomas, regional project manager for Healthy Kids Out of School, agrees. She said the Healthy Unit Patch, which units can complete in about three months, has been well-received in initial testing in the New England area. Koomas and her colleagues even spent time teaching fun, active games to a bunch of grown-ups at roundtable meetings. Start earning the patch now, and your Scouts will be on their way to establishing healthy lifelong habits!